One of the best ways to bring about the Tiki Island Life in your environment is to acquire your very own garden statue of a Tiki (or perhaps several). While tiki torches, tiki huts and luau decorations in general can help you create your own Tiki Island Life, nothing can transform a place from “boring” to “tropical and exciting” like beautiful Tiki Statues. These attractive symbols of Polynesia can form a striking addition to a landscape, adding a focal point or a finishing touch to tropical foliage arrangements, or provide accent and decoration on a deck, patio or even within the home. There are several ways you could have Tiki Sculptures of your very own. Making your own Tiki is the best. It not only involves you personally in the creation of this transformative work of art, but also gives you the widest possible range of choice in style and appearance, according to your own taste. In addition, there is the sense of pride in your creation that greatly enhances the overall experience. Traditionally, Tiki sculptures were carved out of wood,- very likely from palm tree trunks since they are ubiquitous in the regions in which they were and are made. If you are lucky enough to live in an area in which palms naturally grow, a palm trunk carving may be your best bet. Carving palm tree trunks can be a bit tricky, however, since most of them have an inside texture of very hard and dense sponge, with thousands of flexible, but very tough straw-like fibers running vertically (many of them still retain a great deal of water). Because of the water content, these trunks can be deceptively heavy. If you plan to harvest a palm tree or move a sizable palm trunk to create your own Tiki, be sure to engage the services of a professional who can get the job done safely (getting hurt is inconsistent with creating your Tiki Island Life). There are many instructive videos on this topic on YouTube and elsewhere, using a variety of tools and techniques, from chainsaws to chisels. This approach would obviously call for at least a moderate to good level of skill in use of hand and power tools, as well as in woodworking in general. 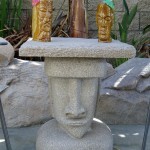 For more information about carving a tiki, check out the post “Creating Your Own Tiki” on this site! For those who would like to create their own Tiki, but don’t have the opportunity or inclination to carve one, an option may be to create one out concrete, using a mold. Using a mold could provide a relatively easy way to create a Tiki Sculpture, the results of which would be all but assured. Depending on the quality of the mold/form used, it is quite possible that you may be able to easily create several statues if you wish. Molds and forms for concrete garden statues in general, and for Tiki sculptures specifically, can often be found from several sources online. If you would like to have your Tiki without the investment of time, effort (and, yes, sometimes aggravation) of making your own, consider just buying one. They can be easily had in a variety of ways, for just about any budget. If, as mentioned before, you live in an area in which palm trees grow, it is likely that you will be able to find a variety of Tikis at the mercantile establishment of a local craftsman or artisan. 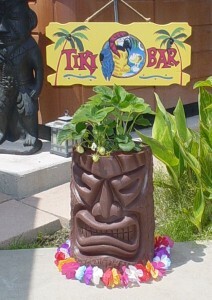 You may even be able to hire one to create a Tiki of your own design and of the specific dimensions you require. Obviously, smaller ones require less material, time and effort and are therefore cheaper; bigger ones are more expensive. If you have the option of several sources, shop and compare. While I have seen many beautiful, large sculptures that were as pricey as one might expect, I have also seen wonderful examples of virtually the same quality that were Very inexpensive. Different artists have different price structures, so do some digging and you may be pleasantly surprised. If you don’t live where tikis are “indigenous,” fear not. 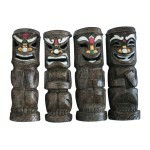 Tiki Statues can be found from a multitude of retail sources online. Smaller Tiki Statues have several points to recommend them. First, they are easy for anyone to handle and move. Many are between 6 to 12 inches tall, making them simple to place around the home or patio for a Hawaiian themed party, or simply to change the look of your tropical decor. Second, they are likely to be relatively cheap, while retaining that Polynesian motif. Because of points one and two, they lend themselves to groupings with multiple pieces, making their effect even more striking. 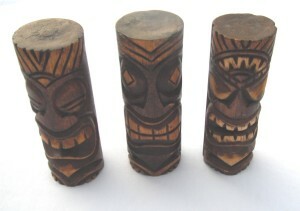 Some smaller Tikis are wood carvings that, while simple, offer great character, texture and attractiveness. They can be had in quite a variety, from stained and polished wood to those that have been painted and adorned quite intricately. Because many (if not most of them) are hand crafted, it is likely that no two will look alike which gives them an added air of uniqueness and authenticity. 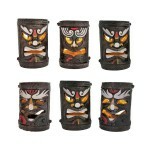 allow placement along walkways, gardens, pools or any other place you’d like to enhance with illuminated Tikis! Obviously smaller Tiki statues would not lend themselves so much to landscape placement, as they would simply be too hard to see, and would likely get overlooked. They might, however, be able to function as attractive accents if they were placed in a relatively small courtyard or enclosed area (or used as patio lights, as just mentioned). Large Tikis make the boldest statement and are likely the most authentic. Often carved from palm trunks (although other woods are used, as well), they just seem to exude an air of the South Seas! These are the sculptures that can enhance and enliven any outdoor landscape environment! While larger, heavier and more difficult to situate (you certainly wouldn’t move these around often), they can enhance even the most attractive and well planned tropical landscape, and draw even more attention. While some are extremely expensive (they are, after all, generally hand carved works of art), some are available at relatively reasonable cost. That may be especially true if you are able to find one available from a local artisan. If you are unable to find anyone who makes them locally, you can still find excellent reasonably priced pieces online. With one of these larger pieces, there are many options for their use. They can certainly find a place on a patio or deck, and perhaps transform a pool or hot tub into a tropical oasis. Because of their size, they are less likely to be found inside the home (unless that home is big enough to accommodate them and they fit well with or complement the decor). Of course, they can serve beautifully in the landscape, guarding the home and premises from danger and chasing away evil. Singly or in groups, they are very attractive strategically placed at certain places around the perimeter of the home, or used as accents or focal points within a planned tropical landscape, designed with specimen palms (taller), groupings of understory palms and any number of tropical shrubs and low growing plants to give contrast and definition to all landscape components, including the Tiki. While Tiki Statues are beautiful and exciting works of art, suggestive of the rich culture of ancient Polynesia and perhaps an idyllic life (which I believe is more than enough to justify their existence), some would ask more of their Tikis. They would ask more in the sense that they would like their Tikis to be useful in ways other than simply visual. Of course, there are Tikis to fulfill that need as well. 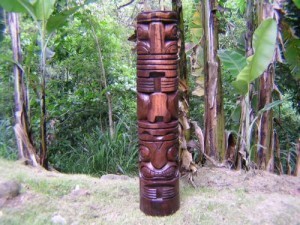 Tikis and Tiki Art can form the basis for all manner of products, from planters to fountains and from lanterns to tables. If it is an item or object that can be made,it is likely that someone, somewhere is making one with a Tiki motif. While that might offend the Tiki purist, I think it is very, very good. It greatly expands the many ways in which anyone can, with a little thoughtful effort, tastefully arrange and structure a multiplicity of items to help them in their quest to create their very own Tiki Island Life!